Artwork details: gouache, 13.5 x 20 inches (34 x 51 cm), 2003. Many of my fairies are up to no good, in a small way. Not actually evil, you understand (though there are certainly some evil fairies), but generally not very nice or well behaved. Often they can be found drinking, more frequently they can be found drunk. 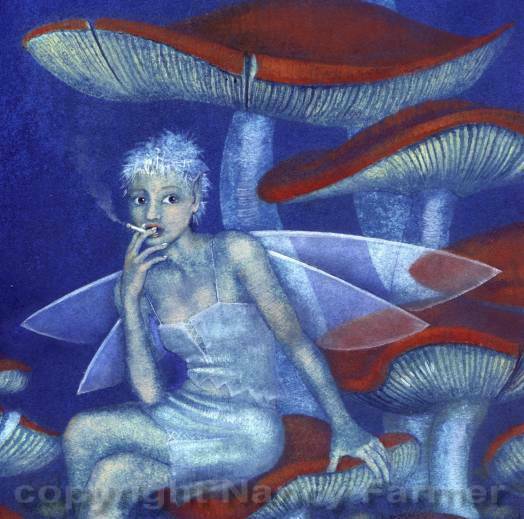 This fairy, however, is simply enjoying a quick fag, in a guilty sort of way, amongst the toadstools. 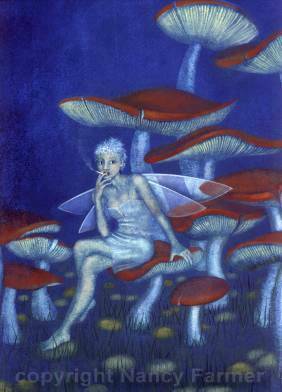 Whether smoking is actually bad for fairies I couldn't say for certain, though I suspect it isn't. It's possible that fairies live for ever, just like angels and demons - they're all related, you see, according to a rather nice legend which explains how the fairies, demons, goblins and what-have-you all came about - I don't know the source of the story without going through a lot of tedious research but it is a real legend all the same, not something I just made up (like some of this website...). It all goes back to the fall of the rebel angels. The story goes something like this - God, as we know, chucked Lucifer and his unruly mob out of Heaven for suggesting that maybe someone else should be in charge for a change. He threw an awful lot of them out of Heaven, and down they fell, a great stream of them, worst ones first, in to Hell (conveniently situated directly underneath heaven in case of just such an event). So, after a while God looks around, and Heaven is starting to look a little empty... and the angels are still falling out. And heaven gets emptier still, and he starts to get a little worried about this and suddenly he says 'Stop! - Everyone stay where you are'... and so they do (God's word being absolute truth and all that). Of course they can't be let back into Heaven, because God threw them out in the first place (which was of course another absolute truth) and so just stay put. Well the worst ones had already got to hell, but the others, well they were only half way down. Some stuck in mid air, half way through the sky, some were stuck on the ground - on earth - since, as it turns out, that was also directly underneath, and in the way. And some were stuck under the ground, not having quite got far enough to pop out underneath, so to speak, into Hell. So all of this lot were stuck: couldn't go down, couldn't go up. And so they became all the other things that are not angels or devils: all the fairies in the air and the goblins in the ground, sprites and spirits and all kind of monsters... and they have been there ever since. Now the Angels all have a purpose, as do the demons (to read more about what demons are for have a look at my entry for 'Devils Tea Party. But the fairies, well they were just left hanging around, rather meaninglessly. Many of them have since found gainful employment, though - fortunate, really, as there are rather a lot of them, and despite what JM Barrie may have claimed, one fairy does not drop dead every time a child says they don't believe in Fairies - they just get very irritated. And on the subject of why not to irritate a fairy have a look at the Bank Holiday Fairy (click thumbnail to the left).